Burnham Beeches & Stoke Common are located in Buckinghamshire to the west of London. They are both scenic green spaces and important wildlife habitats. Contact: Ed Gilbert (for practical tasks); for other enquiries, contact the office. 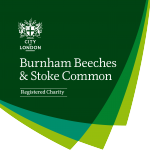 Regular meetings every Thursday and once a month on a Sunday for practical tasks, usually at Burnham Beeches but sometimes at Stoke Common. For other volunteering opportunities like biological surveying and office assistance, contact the office for more information.